Barcelona, Spain. Language: Spanish. Publisher: Sociedad Teosofica de Espana. Editor: Jose Roviralta Borrell (?). 1/1, January 21, 1894-3/30, June 21, 1896. 8 pp., 2 pesetas a year in Spain, 8 elsewhere. 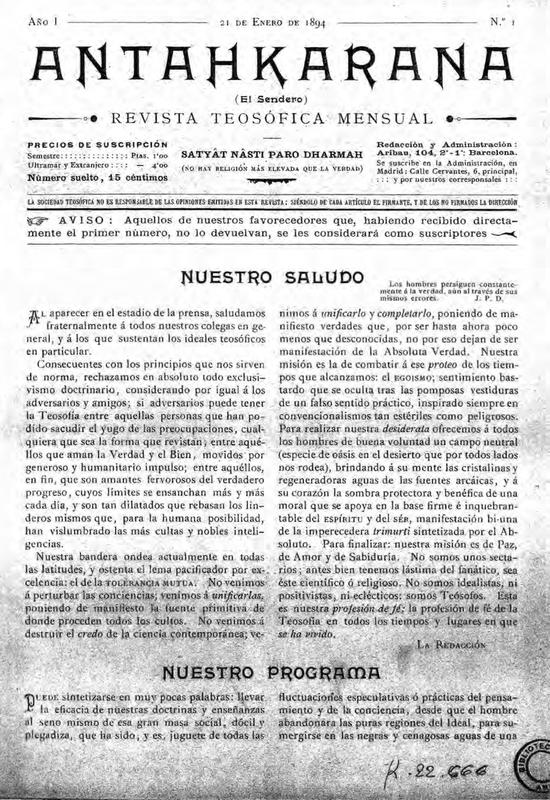 The journal was published by the Rama Branch of the Theosophical Society, in Barcelona, and, as it said in its farewell issue, saw as its mission the spreading of Theosophical ideals in "vast field of the less-privileged classes." The journal included contributions by Jose Plana Dorca, Arnaldo Mateos, Alexander Fullerton, H. Snowden Ward, and others, and carried a running translation of the Bhagavad Gita and of Godolphin Mitford's "The Elixir of Life." The political bent of the journal. shared with many other Theosophical journals of the time, can be seen from "Socialismo Verdadero Conduce a la Fraternidad Universa." Archivo General de la Guerra Civil Espanola.